Mats Jonasson (yu-na-son) has spent a lifetime working with glass. In 1959, at the age of 14, he joined the Maleras Glasbruk AB in Maleras, Sweden as an engraver. His father, who also worked there, knew his son was an excellent artist and recommended him for the job. Ten years later, Mats moved to Kosta, and then returned to Maleras in 1975. Since that time, his love of nature has manifested itself in his acclaimed crystal sculptures. Jonasson begins his work with a drawing. He then carves a plaster replica of the finished piece. 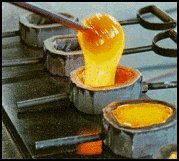 Unlike plaster or resin collectibles, a silicone mould will not work with molten glass – the mould created from Jonasson’s replica is iron. He then works on the iron mould directly, using diamond drills and files to clarify its details. The full lead crystal used in the finished piece is a special blend developed by the Swedish Glass Research Institute. This crystal is known for its extraordinary refraction and brilliance. After casting, the glass is annealed for 15-20 hours. Any pieces with imperfections – such as air bubbles – are discarded before the laborious post-production begins. This involves sandblasting portions of each piece, with various grades of cutting sand at different velocities. 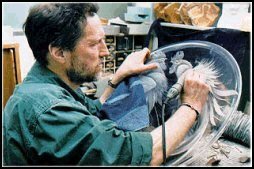 Each sculpture is then ground and polished, and finally minute details – such as plumage – are achieved with engraving. Certainly the most successful line of Jonasson sculptures is his “Wildlife” series. His subjects range from wolves to penguins, from dolphins to gorillas, from eagles to elephants. Nature is also the focus of Jonasson’s extensive line of paperweights. Retired pieces are highly collectible. The Mats Jonasson Collectors’ Society has its own exclusive pieces. This year’s Members Only piece is “The Prince of the Jungle”, a lion cub. Since 1997, Jonasson has produced a yearly Limited Edition sculpture that is issued in a run of 975 pieces. This year’s Limited Edition is “The African Buffalo”, pictured left. Previous Limited Editions were “Cheetah” 1997, and “Elephant”, 1998. In addition to the “Wildlife” series, he also creates unique lines of bowls, vases, and floral sculptures. Jonasson recently introduced his “Totem” series, inspired by native mask-making. The quality of craftsmanship and artistry all but assures that Mat Jonasson’s work will continue to grow in value on the secondary market. NOTICE – This site is not affiliated with Mats Jonasson TM. The purpose of these pages is to provide information to collectors of Mats Jonasson crystal.